In 2017, Hallmark’s spend with diverse suppliers — those owned by minorities, women, veterans and members of the LGBTQ community — increased 12 percent from 2016 with 9 percent of its diverse spend coming from new suppliers, a 3 percent increase over the prior year. The company’s supplier diversity efforts demonstrate its commitment to promoting economic growth and sustainability within the diverse communities in which it does business. A long-standing tenet of the program has been to leverage Hallmark’s more than 100 years of experience as guidance for supplier and sustainability efforts. Hallmark ensures new suppliers who come through the procure- ment process are asked about their sustainability policies, environmental stewardship and code of conduct. To that end, Hallmark established its Supplier Diversity Awards, given each year to honor suppliers and employees who strengthen the supply chain, multicultural marketplace and commitment to diversity and inclusion. Four awards were presented in 2017: two supplier diversity advocate awards for aggressively soliciting and encouraging purchasing from qualified suppliers, and two outstanding supplier awards that exemplify excellence in their partnership with Hallmark. 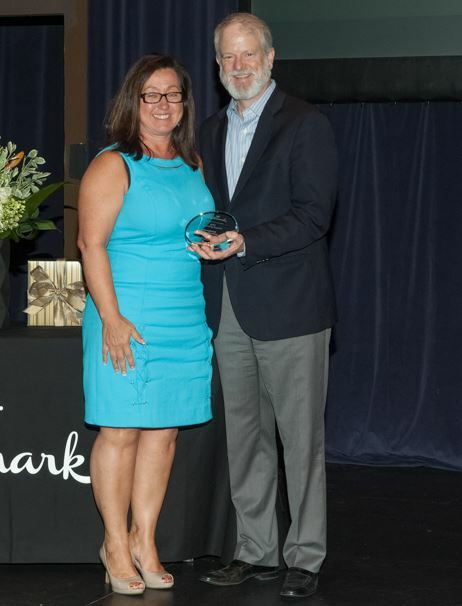 Photo caption: Dave Hall, president, Hallmark (right) presents an award of recognition to Karen Duff, CEO, International Express Trucking (IXT) as part of hallmark’s 2017 Supplier Diversity Awards. As a transportation provider for Hallmark, IXT is a critical and responsive partner. The woman-owned business absorbed significant increased volume to the Kansas City area and provided Hallmark with additional storage and services during the prior year.